In Hollywood terms, it seems that Mel Gibson has served his time. After various controversies (including instances of anti-semitism, racism, and sexism ) that saw him spend a decade in the cinematic wilderness, Hacksaw Ridge sees the hyphenate filmmaker return to the director’s chair. 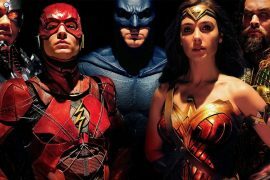 Whether you’re able to look past Gibson’s past indiscretions is your own business, but it seems the world of film is now happy to welcome him back into the fold. Hacksaw Ridge has just been nominated for Best Picture at this year’s Academy Awards, but for me his long-awaited return is a frustrating one. 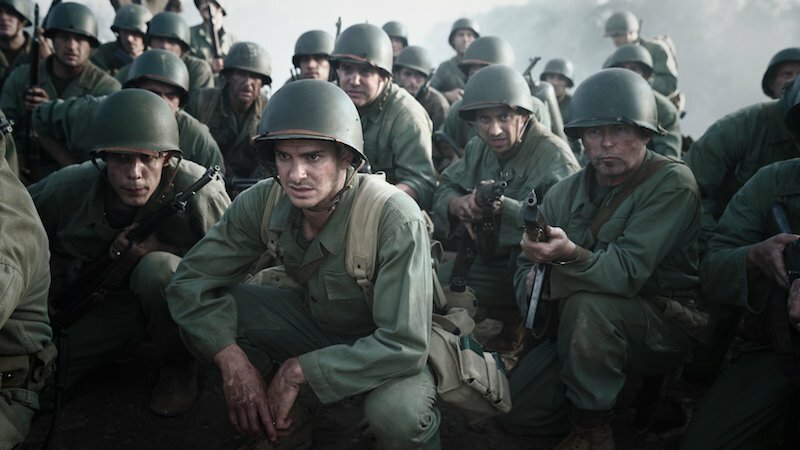 The film is based on the incredible true story of Desmond Doss, a conscientious objector who nonetheless fought for his country in the Pacific during World War II, going on to win the prestigious Medal of Honor despite his policy of never even carrying a gun. 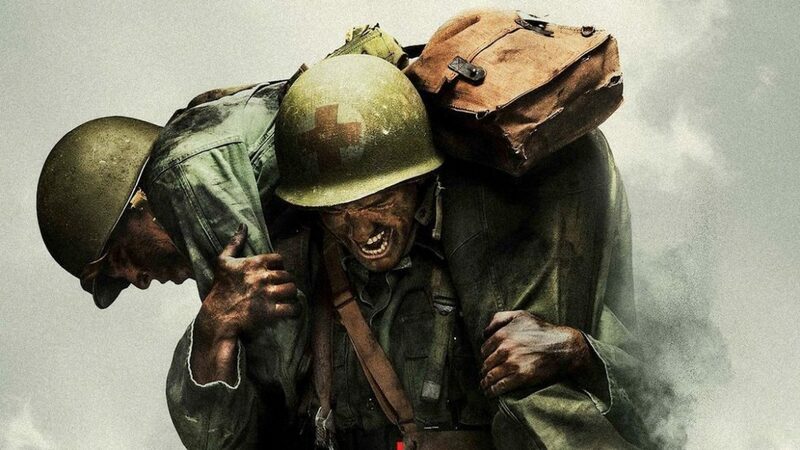 Hacksaw Ridge begins quite conventionally, with the first hour detailing Doss’s childhood, family life, romantic entanglements, and, ultimately, his military training. 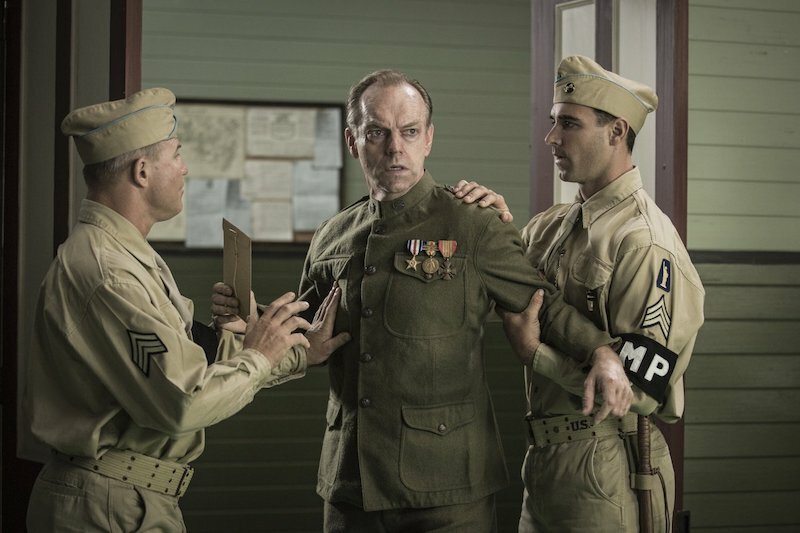 Everything unfolds in a gentile, predictable manner, with a screenplay that seems content to trot out all the clichés and tropes that you’d expect — even down to Vince Vaughn’s implausibly stern and shouty Sergeant Howell, who owes more than a small debt of gratitude to R. Lee Ermey’s infamous drill sergeant in Full Metal Jacket. But if it’s conventional, it at least has the decency to be entertaining, too. As Desmond’s love interest, Teresa Palmer offers winning early support, while Vaughn’s Sergeant is undeniably a hoot, even as he’s very knowingly playing a caricature. 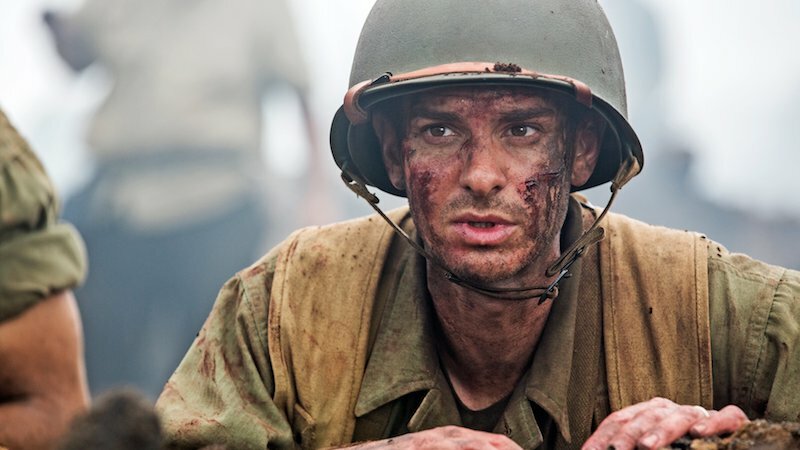 And as the sweet-natured young man at the heart of the story, Andrew Garfield is a perfect fit; his likeable and somewhat dopey performance conveying the contradiction at the heart of Doss (a man of peace with a desire to go to war) very well. And it’s that contradiction that provides the most interesting material in the early going. Doss wants to go to war as a medic, feeling that he can’t sit by while his fellow Americans die in droves. But his refusal to complete the obligatory rifle training pits his comrades against him (after all, who wants to go to war with someone who perhaps won’t have your back in a firefight?) Doss’s stubborn-yet-sedate resolve is tested by his superiors, who refuse to let him pass training until he picks up a gun, and while we’ve seen sequences of military training a thousand times at the cinema, Doss’s ideals at least present a fresh, interesting twist on proceedings. But it’s when Doss goes to war that the movie really comes alive. Once Doss and his men (under Sam Worthington’s Captain Glover ) hit the titular elevation, Hacksaw Ridge becomes one of the most incredible war movies seen in many a year. A standout 30-40 minute action set-piece is astonishing. Gibson has, quite simply, shot some of the most frantic and visceral war sequences ever committed to film. Each frame comes thick with action, as blood and body parts are tossed across the screen, while grenades, bullets, flamethrowers, and bayonets wreak havoc — tearing people apart without regard or discrimination. It’s extremely intense, and very gory, but also feels very true to the chaos of what we imagine war would really be like. The film gives you no time to catch your breath, either, so you’ll feel nearly as worn out as the surviving soldiers are by the end of it. And while it’s difficult to describe scenes of such brutal chaos as handsome, that’s precisely what they are. The bleak, murky palette conveys the tone, but every explosion, every burst of flame, every flying piece of dirt and debris, is shot with such stunning clarity that you never miss a thing. 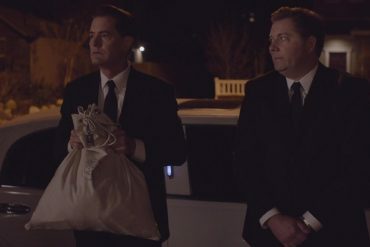 Every iota of destruction is present and correct on screen, and all of it is grimly beautiful. Gibson presents a stunning, grisly vision of war that’ll leave you breathless. All of which makes Hacksaw Ridge’s final third so disappointing. Despite the horrors of war, the film does a good job of showing how a man like Doss can actually do some good out on the battlefield, even without a gun in his hand. He flits across the ridge helping anyone he can, whether with morphine and bandages, or simply encouraging words. And yet all of that good work begins to unravel as the film begins to lay everything on far, far too thickly. Where Doss’s heroism is understated (but obvious) at first, the film eventually goes out of its way to turn him into the sort of hackneyed all-American action hero that makes smart audiences roll their eyes. While the implausibility of Doss’s heroism isn’t to be scoffed at, the way it’s depicted on camera becomes an overwrought mess. Overdoing Doss’s accomplishments, by stating them explicitly rather than subtly, robs his story of its essential power. The inherent power in the story of a quiet man who saved dozens of lives because he was just going about his business, descends into something altogether more arch and less fulfilling. 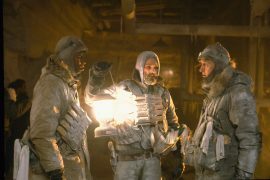 Gibson’s film devolves into the sort of war movie that puts many people off the genre. By the time Doss is swatting live grenades out of the air, it’s become very difficult to take his story seriously. And while it’s all very rousing (the score by Rupert Gregson-Williams is supremely effective), ironically, a movie about a humanitarian soldier loses its humanity. Plus, of course, the Japanese soldiers are dehumanised; a faceless enemy washing over the landscape to slaughter and be slaughtered, with nary a thought given to their own humanity. The inclusion of a seppuku scene (the only moment the film dedicates to the Japanese point of view ) also feels crass and unnecessary; the story only acknowledging the Japanese viewpoint if it means getting to show outlandish gore and violence. writer: Andrew Knight & Robert Schenkkan. starring: Andrew Garfield, Sam Worthington, Luke Bracey, Teresa Palmer, Hugo Weaving, Rachel Griffiths & Vince Vaughn.